Are you one of the half of all Americans who find themselves embarrassed by their smile? 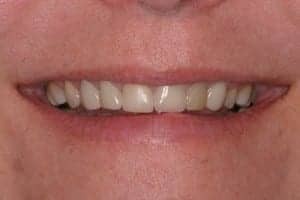 You know that you would seem more friendly to people if you would smile more, but you may have gaps or chips, or you may have a tooth that is out of alignment, and you just don’t feel enthusiastic about smiling. If you only knew how easy it could be for a dental artist like Dr. Arnold to create a beautiful new smile for you! If you’re looking to completely transform your smile, porcelain veneers will do just that. They are thin wafers of porcelain, customized and sculpted to give you the perfect smile. Porcelain is the ideal material for a smile makeover because of how beautifully it mimics the translucency and sparkle of your natural teeth. The glaze gives it a glossy shine like enamel. The surface porcelain can be translucent just like enamel, with more opaque porcelains under the surface to be able to make whatever color changes you would like. They can also completely change the shape and size of your teeth, close gaps, and make crooked smiles appear straight. 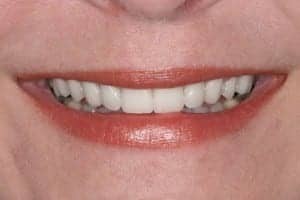 Many people are under the impression that any dentist can do a smile makeover with porcelain veneers. Some people learn the hard way that this isn’t true. Renee is a patient who came to Dr. Arnold after having spent thousands of dollars on porcelain veneers from a dentist who claimed to be a cosmetic dentist. You can see the results below on the left. Her teeth look dingy and gray, and she was heartbroken over the results. Dr. Arnold discussed with her how she wanted her smile to look. Then he and his master ceramist, Mike Morris, created a beautiful new smile, which you can see below on the right. Dentists are trained in dental school to fix things. Most of them really don’t have that passion for art that is required to create a beautiful smile. As a result, they don’t pursue the post-graduate training needed to become an expert cosmetic dentist. For this reason, the American Academy of Cosmetic Dentistry (AACD) created the accreditation process. To become accredited in cosmetic dentistry, a dentist needs to attend post-graduate training and then pass a written exam, a clinical exam, and finally an oral exam, demonstrating that he or she has the knowledge, skill, and artistic talent to be able to create a beautiful smile. To be assured that you will receive expert cosmetic dentistry, we would recommend that you seek out an accredited cosmetic dentist like Dr. Arnold. But Dr. Arnold has taken his craft several steps beyond just being accredited by the American Academy of Cosmetic Dentistry. When he took his examinations, the examiners were so impressed with his work that they invited him to also become an examiner, judging the skills of other dentists. 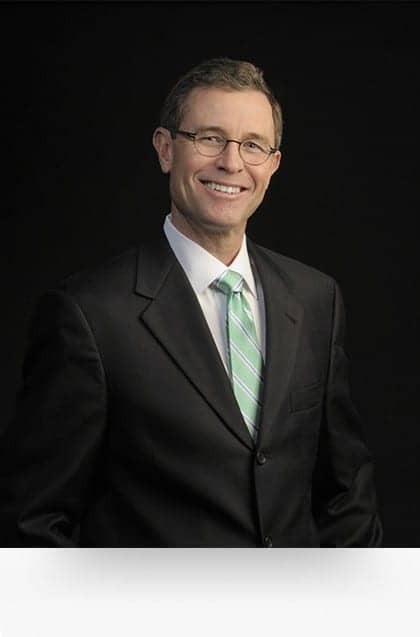 Then, several years later Dr. Arnold took the next step and became an Accredited Fellow with the AACD, one of only about sixty dentists in the world to achieve that highest level of distinction in cosmetic dentistry. Besides that, his master ceramist, Mike Morris, is also an Accredited Fellow of the AACD, one of only four ceramists in the world who has achieved that credential. Together, they have won multiple gold medals in the International Smile Gallery competition of the AACD. Dr. Arnold and Mr. Morris are so confident that you will love the new smile they create for you, that they offer a beautiful smile guarantee. Click here to read more about that guarantee. Dr. Arnold’s first step in creating a new smile for you is to listen to you. How do you want your teeth to look? How bright do you want them? 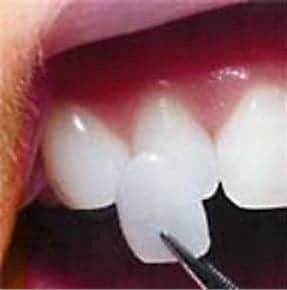 From that, he will use his artistic skill to create a set of temporary veneers for you to wear and try out. The look will be evaluated and tweaked to make sure they meet your expectations. When all the changes have been made and you are thrilled with how they look, he will take photographs which will be used by his master ceramist to create the same look in porcelain. After the porcelain veneers are made, there will be one final check as they are tried in your mouth. With all the preparatory work that has been done, you are certain to love how they look. But if not, he will make whatever changes are needed. Once you truly love them, they’ll be bonded onto your teeth. Dr. Arnold loves seeing your confidence transformed when you receive the smile you’ve always wanted. If you’re ready to remake your smile, you may click here to request an appointment, or call our office to schedule one directly.